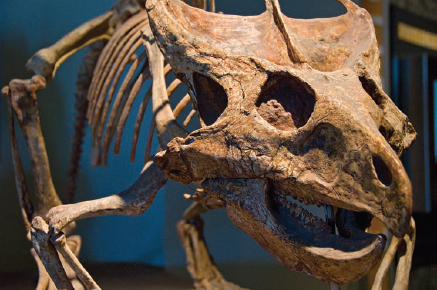 How are missing dinosaur bones restored to a skeleton? When a dinosaur skeleton that is to be exhibited has missing bones (which is the case for the vast majority of fossil finds), these bones must be restored. This is accomplished in a variety of ways: Some missing bones can be replaced with fossil bones or casts from another individual of the same dinosaur species. Often times, two or more partial skeletons can be combined to produce one complete skeleton. If these methods can not be used, the missing bones can be sculpted from a variety of materials, such as wood, epoxy, or ceramic. Mounting a dinosaur fossil for display is almost more art than science. Often missing bones need to be replaced with molds, and sometimes new discoveries make it necessary to rearrange the bones already mounted (Big Stock Photo).